> This weekend is the annual Yulefest at the Nordic Heritage Museum in Ballard, just a few blocks north of us. Today Zorg and I went and up and channeled our fathers’ Scandinavian ancestors as we ate at a lunch of open-faced sandwiches (meatball, egg salad, and herring), split pea soup, cakes, cookies and rommegrot. I’d gone up to the Yulefest when it opened at 10 a.m. to scout the crafts booths, and stopped in at the aebleskiver cafe to watch them prepare these spherical Danish dessert pancakes. 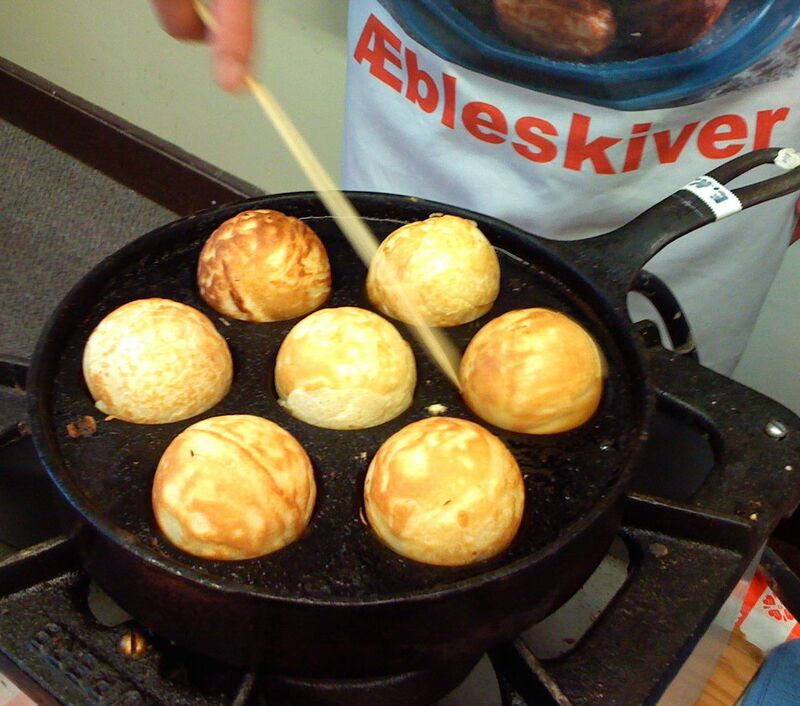 While various websites I consulted later compared aebleskiver to American pancakes, they remind me a bit of beignet. They’re cooked in an aebleskive pan, cast iron with seven hemispherical indentations for the batter. As they puff up, you rotate them using a thin wood skewer or very delicate fork until they are round and brown. Like beignet, aebleskiver are sprinkled with powdered sugar; in addition they come with a side of jam. My favorite Scandinavian food (well, after Swedish korv, which isn’t on the Yulefest menu) is rommegrot, a Norwegian porridge I first encountered at the Yulefest several years ago. It’s fairly obscure, but I chased down some recipes and in the process discovered that there are two types of rommegrot: One includes sour cream or yogurt; the other uses regular cream. I’m definitely a fan of the sour-cream variation. Since the recipe involves combining butter, flour, sugar, and (sour) cream and then topping the resulting hot porridge with more butter and sugar, plus cinnamon, this is not a dish you’d indulge in frequently. I have devised a one-serving recipe for it, but usually just wait for Yulefest to enjoy it. Here’s a good recipe from the Sons of Norway website; it even it tells you how to make your own sour cream using whipping cream and buttermilk.